I woke up early Thursday morning to the beating of wind gusts against our bedroom window. Before we went to sleep, the last we heard from the news forecast was that our small community along the Jersey shore would be covered in 3-to-6 inches of snow. But the wind kept howling all night, and it sounded nasty outside. Matt jumped out of bed. He loved snow. His only quam with going to Arizona for spring training was that the weather stayed the same every day—clear blue skies and sunny. He liked the seasons. Today was the first snowfall of winter that we’d seen, and he begged me to take a walk with him around the block. I refused, wanting to stay inside in the warmth with my mug of coffee. He bundled up and closed the door behind him. He was back inside five minutes later. He said the wind burned his throat and the snow covered his eyes. It was a brutal snow storm with blizzard-like conditions, dumping way more than six inches. Needless to say, we were stuck inside our apartment for the remainder of the day. We decided to binge-watch a new series. We started “Peaky Blinders” on Netflix, and I dove into the world of an English gang in the early 1900’s, but after the first episode, Matt was up pacing the kitchen and living room. He couldn’t sit still very long unless something sparked his attention. “Peaky Blinders” was out. 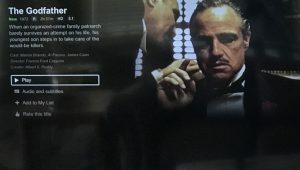 I spent 20 minutes perusing Netflix until settling on “The Godfather.” I had never seen it, and when I told my brothers back in the summer, they hung their heads in shame and abandonment that I was their sister. They had spent the past few months forcing me to watch what they called “classic” movies, like “Back to the Future,” “The Fugitive,” and “It’s a Wonderful Life.” Since I had nothing else to do all day, and despite the movie being three hours long, I pressed play and gave it a go. I was instantly obsessed, being picked up from my couch and transplanted right into a big Italian wedding. Poor Luca Brasi and Apollonia—and that Michael Corleone, who had an extremely different view of justice as his father did—I still wasn’t sure that was a good thing. Matt actually sat down and watched the movie too, and we weren’t ready to leave “the family” yet. I searched frantically for the second movie in between bites of my spaghetti and meatballs, when Matt suggested we start “The Sopranos.” Needless to say, we stayed up much later than usual, binging episode after episode. We couldn’t help ourselves. So we spent the snow day locked inside, just the two of us, watching old Italian movies and shows and eating pasta. The only addition to making the day better would have been the bottle of red wine we had sitting on the counter. But alas, if you had no corkscrew in the middle of a blizzard, you were screwed. we miss matt in chicago, but best of luck this year – WISHING YOU AN MATT A HEALTHY AND PROSPEROUS 2018!